The Golden Circle, Iceland’s most popular tourist route, is even more magical under the glow of the Midnight Sun. Enjoy a late-night dip in the Secret Lagoon, marvel at natural wonders such as the Gullfoss Waterfall and the Geysir geyser, and take in the highlights of the Thingvellir National Park on this 7-hour evening tour from Reykjavik. Hotel pickup and drop-off is included. Your tour begins with pickup from your central Reykjavik hotel between 6pm and 6:30pm and a short journey north to join the popular Golden Circle sightseeing route. Kick off the evening with a visit to the Secret Lagoon and enjoy around 45 minutes to bathe in the natural hot springs. Feeling relaxed and rejuvenated, re-fuel with dinner (own expense) at a local restaurant, before continuing to one of the Golden Circle’s most photographed attractions — the mighty Gullfoss waterfall. Beneath the ethereal glow of the Midnight Sun, the otherworldly landscapes are even more captivating and the next stop will be the Haukadalur Valley, famous for its dramatic lava fields and geysers. 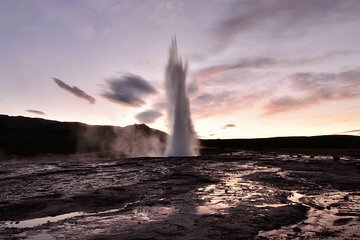 Be sure to visit ‘Geysir’, the original geyser after which all others were named, and the neighboring Strokkur geyser, which spurts water up to 130 feet (40 meters) in the air. Continue to the Thingvellir National park, where you’ll get the rare opportunity to walk right on the meeting point of the American and Eurasian tectonic plates. Learn about the shifting of the plates and their influence on Iceland’s volatile volcanic landscapes from your guide as you admire the views, then hear more about Iceland’s history as you visit the site of the world’s first parliament. After an unforgettable evening adventure, return to Reykjavik where you tour ends with drop-off at your hotel around 1am.